Twitter has just launched a rather cool way for geeks at South By South West to get hired by the company. Twitter @ SXSW displays a map of where Twitter staff are in Austin. If you want to pitch yourself for a job with them, just see where they’re tweeting from and hunt them down. Nifty! There’s even a tool to narrow down your options. If you’re good at ‘Supporting a global audience’, then @Trammell is your man for example. 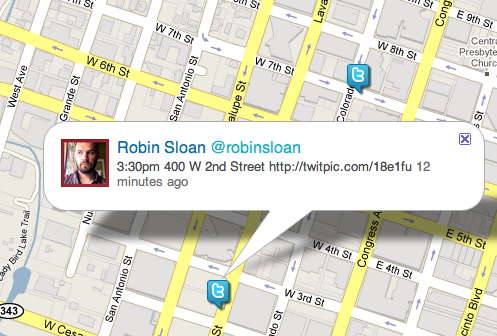 The move comes as Twitter is in the process of rolling out a map and geotagging capability to its web interface. As yet it only works for users in the USA but should be available everywhere soon. Read next: It's A Frap!